On the front lines of customer service, every day presents new and unexpected challenges-and even the most dedicated employees can be caught unprepared. They need confidence. They need training. They need help. Be Your Customer's Hero answers the call. 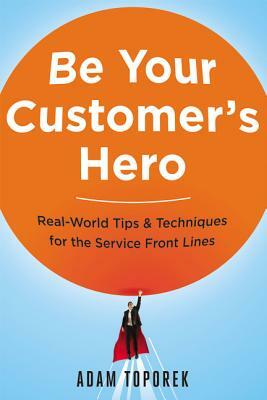 The book provides customer-facing professionals with short, simple, actionable advice designed to transform them into heroes in the eyes of the customers they serve. Quick chapters show readers how to: * Achieve the mindset required for Hero-Class(TM) service * Understand the customer's expectations-and exceed them * Develop powerful communication skills * Avoid the seven triggers guaranteed to set customers off * Handle difficult and even irrational customers with ease * Become an indispensable part of any frontline team Armed with the tools and techniques in this book, readers will start each workday knowing they can conquer whatever problem comes their way. ADAM TOPOREK is a customer experience strategist and founder of CTS Service Solutions, a consultancy that provides organizations with real-world, customer-centric solutions through workshops and training. He authors the popular blog Customers that Stick.